The device offered is a pneumatic braided muscle actuator, able to produce bi-directional force and motion, and variable stiffness. Pneumatic muscles are generally preferred thanks to their high power to weight ratio, light weight, ease of installation, hazard-free use and inherent compliance. The existing/traditional pneumatic muscle actuators has a fixed braid fiber angle and are usually able to produce a pulling force (uni-directional ) when actuated/pressurized. 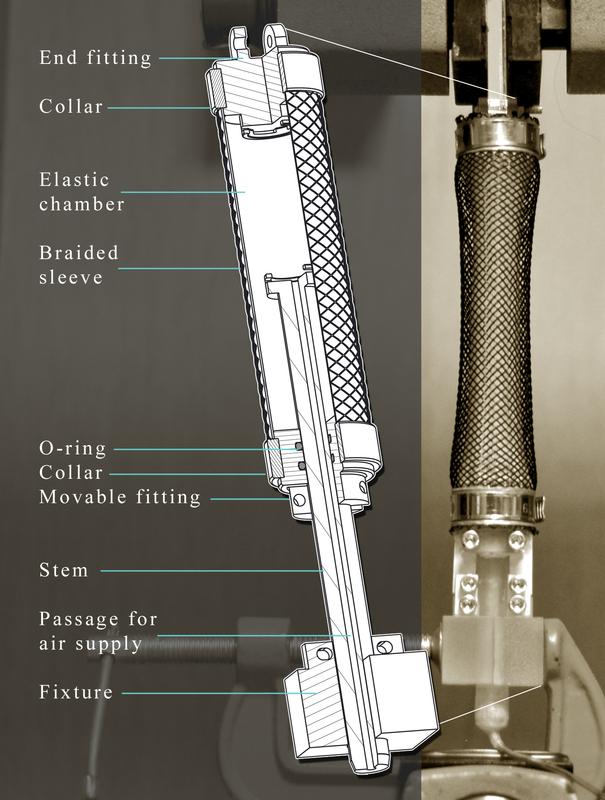 Pneumatic artificial muscles usually consist of a hollow cylindrical elastomeric chamber covered by an outer braided sleeve, consisting of fibres made of un-stretchable material and arranged in an anti-symmetric helical configuration. The hollow internal chamber and the braided sleeve are tightly sealed and attached to rigid end fittings, usually a passage is provided through one of these end fittings for pressurizing the elastic chamber with air or another fluid. The mechanical work done is transferred to an external system through these end fittings. 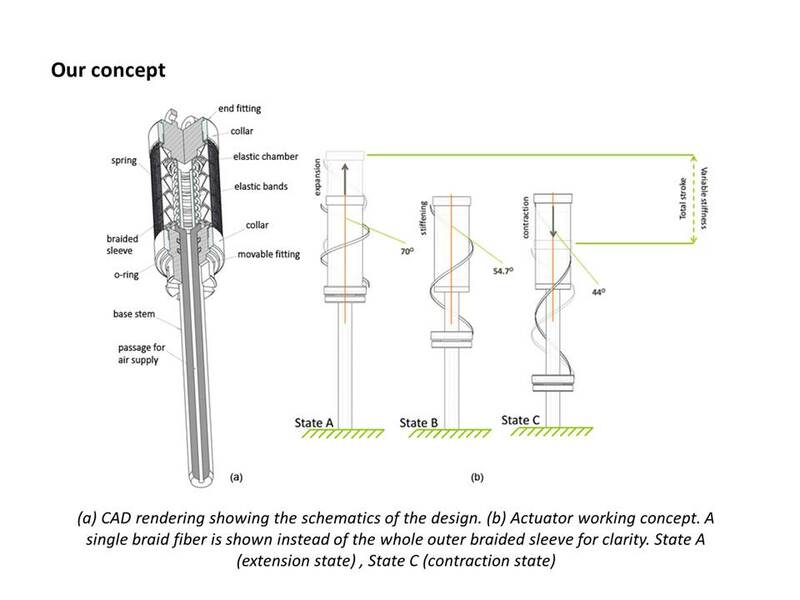 The working principle of the offered device is based on the traditional pneumatic artificial muscles but some fundamental changes to the design, enables the user to change the initial braid fiber angle independently. Depending on the braid angle, the actuator is able to produce extension and contraction upon pressurization, moreover the ability to change the initial braid fiber angle enables the actuator to achieve variable stiffness at each point along the total stroke of the actuator, whereas the traditional pneumatic muscles lack this ability. Able to achieve max stiffness at each point along the total stroke of the actuator. No precise alignment required during installation due to the flexible body of the actuator. A series of prototypes was developed and built to evaluate the feasibility of the concept but not yet an industrial application has been practically investigate and developed, this narrow the market to pneumatic providers but, also, it might be an opportunity for any licensee interested in independent development and diverse application. The offered device is a general linear actuator, which can be utilized in a number of applications ranging from robotics (rehabilitation robotics, manipulation, locomotion) to industrial automation. It can be used in industry for automatic control of valves. As the muscle is able to expand and contract, therefore a single muscle is enough to operate the valve. Moreover its high power to weight ratio, light weight, ease of installation, hazard-free use and inherited compliance makes it ideal for industrial applications. Furthermore it can be used in the robotic domain as an actuator, especially for building robotic prosthesis or rehabilitation devices. The inherited compliance and shock resistance of the muscle makes it a safer actuation system for such devices. A single muscle can be used to operate a single revolute joint resulting in light weight designs, moreover the same muscle can also be used to control the stiffness of the revolute joint. "A basic prototype has been developed to evaluate the feasibility of the concept. Moreover numerical models of the muscle have been developed that can be used to tune the properties (force/displacement) of the muscle for specific applications."